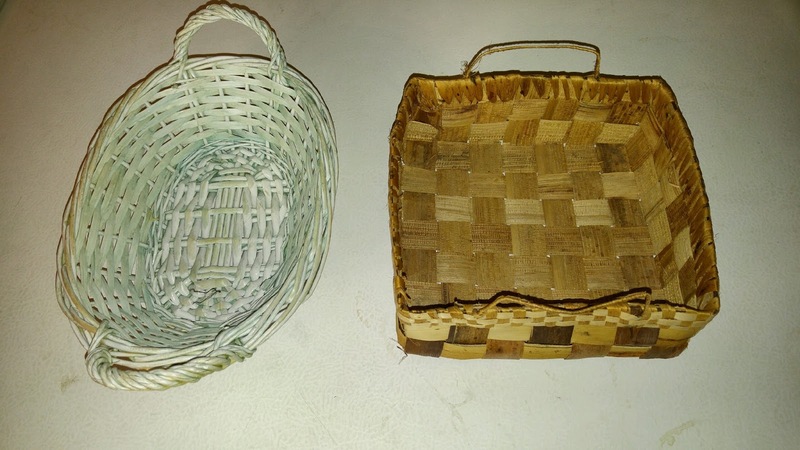 I specifically went to the Salvation Army Thrift Store to get a basket. I came home with two baskets. They are not very large, maybe 8" long. I need something to put on the table next to my Kenmore. When I use that machine, I don't have a waste can near it, and the table ends up with all kinds of thread pieces on it. I thought I would line a small basket with cloth and use it to catch the threads. Then when it was full, or when I think about it, I can just empty it into the trash can. Yes, I could move the trash can or buy a new one. This is just as easy. Besides, if I had two trash cans, Addy would just think that was more choices for her to stick her nose into and get in trouble! If you put a coffee filter in the basket, the threads will cling to it, and that makes it even easier to put in the trash.